With a focus on CameraMatics, a recent report from ProVision has highlighted its concerns over compliance standards within the industry. Ahigh proportion of fleets are not following basic compliance vehicle walk-around checks before driving, and many have not installed safety cameras, according to a recent survey from ProVision. The information comes after a detailed study into fleet risk, conducted by the company, showed fleets may be putting themselves at undue risk by not adhering to basic compliance procedures. With ProVision’s expertise in CameraMatics, the company was surprised to find that just 20% of fleets questioned had cameras in all vehicles, while half had no cameras installed at all. Of those with cameras, 42% were relying on single, windscreen-mounted dashcams without data analysis tools or any reporting functions. While cameras aren’t a necessity, the company is aiming to highlight how such technology can help meet higher compliance standards. The results come from ProVision’s newly developed Fleet Risk Assessment Tool; an interactive survey tool, designed to help commercial fleet operators accurately evaluate individual business risk exposure. This tool gives each respondent immediate personalised insights into how to improve safety and reduce risk to their fleet, and provided ProVision with the anonymous data for the study. The survey focuses on the extent to which key technologies, including cameras, are adopted, as well as how best practice and reporting on incidents are implemented by fleets. Data from the Fleet Risk Assessment Tool, hosted on the ProVision website, was mined from September 2017 to January 2018, with an accompanying extensive report created. This was designed to provide clarity for those reviewing and assessing safety procedures and transport policy, and offer insight into the nature of risk. 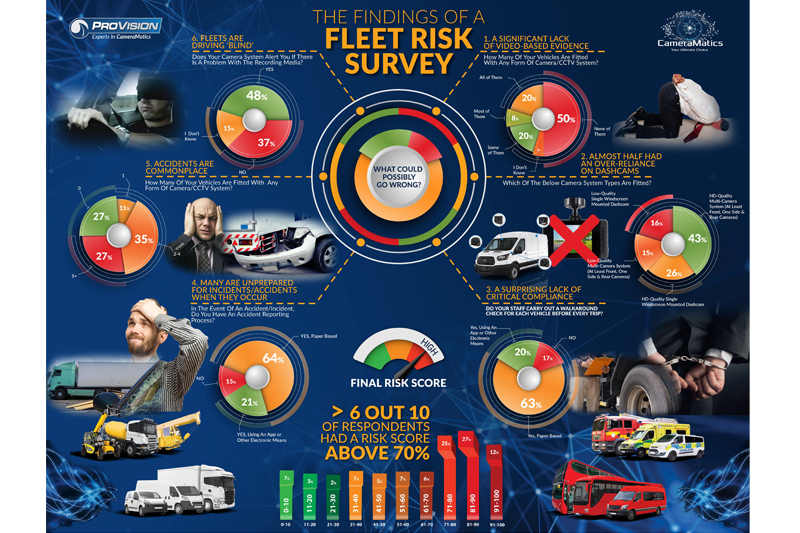 The data was used to create a ‘Risk Score’ grading for those who took part, based on the procedures and hardware each fleet has in place to manage risk. The results showed over six out of 10 respondents had a risk score above 70%. ProVision believes that technology, both hardware and software, holds the answers to reducing risk. Simon Murray, Co-Founder and Sales & Marketing Director at ProVision, commented, “The results show that a surprising number of fleet operators are grossly unprepared and under-protected for incidents and accidents that may occur. Over two hundred responses were gathered over a four-month period, with 123 respondents answering all questions, including bridged answers, according to ProVision. Each response to the questionnaire was given a weighted score according to its perceived ability to reduce risk. The scores were then converted to give an overall percentage of fleet risk. The scoring system is such that it is possible to have a score of zero. This does not mean that a fleet is immune from being involved in an incident, but that the operator/manager has done everything possible to mitigate the risk of an accident, including following compliance best practice, and monitoring all key evidence. Conversely, 100% risk means that a fleet is not operating any technologies that can help them avoid accidents and adequately monitor fleet, driver and hardware performance, and is not actively monitoring compliance.